Have upgraded to latest version, still getting an error on any event attempted to create. We just shipped out a hotfix for Eventbrite Tickets. Can you update to 4.4.7.1 and let me know if the issue persists? I would like to narrow down this issue further. Can you start by going through our Testing for Conflicts Guide https://theeventscalendar.com/knowledgebase/testing-for-conflicts/? I am wondering if you might have a plugin or theme conflict. Begin by deactivating all other plugins, using a theme such as Twenty Seventeen https://wordpress.org/themes/twentyseventeen/, and see if the issue still persists. Also, double check for any other updates available (Dashboard » Updates). If possible, you might want to test this on a staging server. Please let me know if the issue still persists after these tests. Ran the suggested tests on staging. We still see the same issue. We have turned off all plug-ins save Events Calendar, Events Calendar Pro, and EventBrite Tickets. All have been updated to the newest version out today. We also switched to the 2017 Theme. Looking forward to your assistance. This has been broken on our website for many weeks. I’d like to try to reproduce this issue. Can you send me a URL of the Eventbrite events that are flagged as no venue/address? You can see this when you try to add any new event and tell it to send to EventBrite (I wasn’t saving them when I got this error). Thanks for clarifying that. Can you check on your events at Events » Venues and selecting the venue you wanted this associated with. Does it have the full address? I have tried to reproduce this locally and got an error when my venue was incomplete. I noticed that the Eventbrite link of the venue is .scom vs s.com. I doubt that’s our issue here. I just used http://staging.royalcoffee.com/event/this-is-a-test-event/ to create a venue locally and did not receive error messages. Can you try to create a new venue with the same address, but a different venue name and try to use that? I really want to find out why I you are getting errors that I can’t replicate. So sorry this is taking a while to sort out. 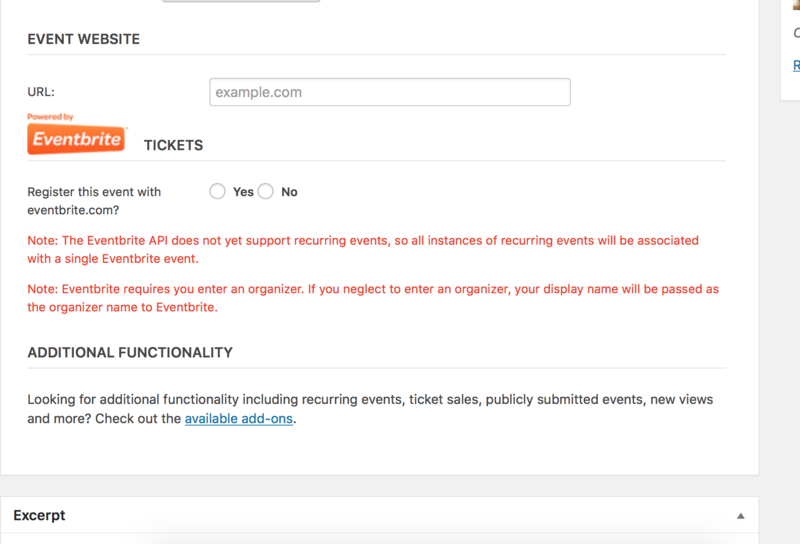 When I look at the test event your created, it doesn’t look as though you attempted to push it to EventBrite and so you wouldn’t see an error (see screenshot – it is not registered with EventBrtite). I’m not sure how one would test for the error without clicking to register with EventBrite. Now, if I create an event and add an entirely new Venue, it does appear to correctly push to EventBrite. However, all Venues in our current system are rejected. For example, I attempted to push this event using this venue (gives an error with or without phone number and website). Has something changed with the way you store addresses where all of our already entered venues are going to be rejected? Can you please attempt to push an event to the Bay Area Co Roasters venue? You can see on Google that is is indeed a valid address. I was able to pass my events on as test events to Eventbrite without issue. I can’t seem to replicate the issues you are having. I am still looking into this and will escalate this issue. I hope we can narrow this down soon. Can you confirm that you’ve gone through our Testing for Conflicts Guide https://theeventscalendar.com/knowledgebase/testing-for-conflicts/ to confirm no plugin or theme conflicts are at play. Would you also enable WP_DEBUG and sharing any PHP errors you see while navigating your site’s home page, events page, single-event pages, and any other of your site’s pages relevant to this ticket? Finally, can you post your most current System Info here? With all that information, I can have a developer look into this more closely. I really want to get this resolved for you. Hi Kandace, I was viewing your site for the venue information, and entering that into my own local site for testing purposes. I have tried to recreate the issue and have not been successful. With your most current troubleshooting help in your last reply, I will escalate this ticket on for additional help. I don’t believe the API is the issue. We can add a new address and synch correctly. It’s as if any address we entered before the latest update is rejected. Obviously, you won’t see this with a fresh instal – you’d need to log-in and try it on our site. I was trying to save my client entering all of their addresses anew. However, this is dragging on so long (almost a month now) we might just need to move forward.